As a member of LiveTribe not only will you have the opportunity to provide your perspective on a wide variety of topics but you will also have the chance to be rewarded for your comments. LiveTribe is offering you, the consumer, lots of great rewards and prizes that can be won from the giving of your opinion, not to mention the personal satisfaction that you get from knowing that you have made a difference to what's seen on the shelves and how companies sell their products. Whilst being a LiveTribe member is fun and rewarding there are also some terms and conditions that you need to be aware of. These are shown below. 1. Members may never use more than one email address or sign-up for more than one membership. 2. Members may not provide their account username and password to other persons. 3. Members must always provide details that are truthful and accurate and must never intentionally provide misleading or false information. 4. Members must always act in good faith and be truthful when participating in research activities directed through LiveTribe. Members agree to take a considered approach to their activity for the benefit of research at all times. 5. Members must update their records within reasonable time when requested. LiveTribe may on occasion issue email reminders to this effect. 6. Members understand that if they are inactive for a period of 12 months all LiveTribe points will be deleted from our system. 7. As a member you agree that all information and content that you read or see is private and confidential and cannot be shared or distributed with anyone else. 8. Members must abide by all the terms listed as a condition of your membership. LiveTribe reserves the right to suspend any members who we see fit to have violated these terms. All points a LiveTribe member has earned during their membership, and any pending rewards will become invalid upon suspension. 9. We reserve the right, at our sole discretion, to change, modify or otherwise alter these terms and conditions at any time. 1 LiveTribe reward points (Points) are incentives offered to registered LiveTribe members for their participation in activities with the LiveTribe Research Panel. 2 Points are redeemable for cash or prizes as outlined in these Terms & Conditions and on the Rewards pages of the LiveTribe website. The types and values of the cash prizes and vouchers available for redemption are subject to change without notice. 3 The equivalent dollar value of LiveTribe Reward Points are variable depending on the reward being redeemed and is subject to change without notice. 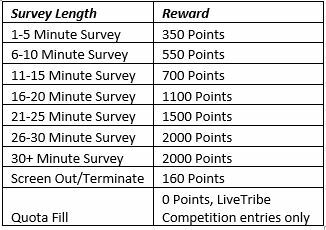 The current points you earn by length of survey are listed below. 4 LiveTribe Reward Points are valid for 12 months from a member's last login. Points not used within this period will be considered expired and will be deleted from the member's account. Points which have expired cannot be redeemed. 5 LiveTribe Reward Points are non-transferable and hold no currency outside of the LiveTribe website. 6.1 The majority of vouchers and rewards redeemable on LiveTribe are delivered electronically via email. Vouchers can only be issued in the name of the member who redeemed the voucher, based on the information on the member's LiveTribe account at the time the redemption is processed. Vouchers and rewards cannot be issued to a different person, however it is possible to send them to a different email address if we are notified before a voucher has been processed (usually within 48 hours of the redemption order being made). 6.2 We are unable to change redemption orders once they have been processed. If you have made a mistake or changed your mind about a redemption and contact us before it has been processed through our system (usually within 48 hours of the redemption order being made), we will generally be able cancel your order. In the case that we are able to cancel an order for you, we will reinstate the points you had redeemed back to your account. 7.1 Retailers and issuing entities impose different expiry periods for their vouchers, gift cards and credits. Vouchers, gift cards and credits not used before their expiry are forfeited and no replacements will be issued by LiveTribe under any circumstances. 7.2.2 The method for delivery is at Rewards Come True's discretion and is generally via Australia Post regular post. LiveTribe will not authorise the use of any alternate delivery methods requested by a member unless the member is willing to have the delivery cost deducted from the value of their card. 7.2.3 LiveTribe accepts no responsibility for delays or losses caused by the postal delivery service. If a member does not receive their gift card within the given delivery period and notifies us within 8 weeks of the redemption being made, we will make all reasonable efforts to liaise with Rewards Come True to arrange for a replacement card to be issued, provided the original card has not been activated and used. Issuing of a replacement card incurs an AU$10 processing fee which will be deducted from the value of the replacement card. 7.2.4 Eftpos gift cards must be activated within 3 (three) months of being received. Instructions for activation are outlined in the letter which accompanies the card. Cards not activated within the given period are forfeited and no replacements will be issued under any circumstances. 7.2.5 Eftpos gift cards not used within their given expiry period are forfeited and no replacements will be issued under any circumstances. 7.3.1 As of April 5th, 2018, PayPal charge an administrative fee of $5.99 for payments made to non-Australian accounts. LiveTribe will not be responsible for the $5.99 transaction fee. The $5.99 will be deducted from the $50 redemption so that we will deposit $44.01 into your PayPal account. 1 Unless expressly stated within these Terms & Conditions, any expenses incurred in participating in any of the LiveTribe Research Panel's promotions are the responsibility of the Registered Entrants. 2 All prizes are valued in Australian Dollars. 3 Cash prizes may be awarded in the form of a cheque OR awarded through the online PayPal system to the winner's personal PayPal account, with the choice of payment method at the discretion of the Promoter. 4 The Promoter's decisions are final and no correspondence will be entered into. 7 Any contact details entered incorrectly on the website shall be deemed invalid. 8 The use of any automated entry software or any other mechanical or electronic means that allows an entrant to automatically enter repeatedly is prohibited and will render all entries submitted by that entrant invalid. 10 The Promoter collects personal information in order to conduct the Promotions and may, for this purpose, disclose such information to third parties, including, but not limited to, Prize suppliers and as required, to Australian regulatory authorities. Entry is conditional on providing this information. The Promoter may, for an indefinite period unless otherwise advised, use the information for promotional, marketing and publicity purposes including sending electronic messages or telephoning the entrant. Entrants should direct any request to access, update or correct information to the Promoter. All entries become the property of the Promoter. 11 Eligible Entrants consent to the Promoter using the Eligible Entrant's name, likeness, image and/or voice in the event they are a winner (including photograph, film and/or recording of the same) in any media for an unlimited period of time without remuneration for the purpose of promoting the Promotions (including any outcome), and promoting any products manufactured, distributed and/or supplied by the Promoter. 12 The Promoter reserves the right to request the Participant to provide proof of identity prior to receiving the prize. Identification considered suitable for verification is at the discretion of the Promoter. 13 The laws of Australia apply to this Promotion to the exclusion of any other law. Entrants submit to the exclusive jurisdiction of the courts of Australia. 14 Each Eligible Entrant hereby warrants and confirms that his/her participation in these Promotions is not illegal or prohibited according to the laws of his/her country and any other applicable laws, and that he/she has obtained all necessary approvals and consents to enable him/her to participate in the Promotions. If an Eligible Entrant’s participation in the Promotions would contravene the applicable laws in his/her country of residence, he/she is not permitted to participate in the Promotions and his/her entry will be deemed invalid. 15 Unless expressly stated within these Terms & Conditions, Promotions on the LiveTribe Research Panel are open to residents of Australia and New Zealand only. 17 The Promoter reserves the right, at any time, to verify the validity of entries and entrants (including an entrant's identity, age and place of residence) and to disqualify any entrant who submits an entry that is not in accordance with these Terms and Conditions or who tampers with the entry process. Failure by the Promoter to enforce any of its rights at any stage does not constitute a waiver of those rights. 1 Information on how to enter and prizes form part of these Terms & Conditions. Participation in LiveTribe's $5,000 Cash Giveaway ("the Promotion") is deemed acceptance of these Terms & Conditions. 2 Entry to the Promotion is open to members of the LiveTribe Research Panel ("Eligible Entrants"). Eligible Entrants must meet the required criteria for registration with the LiveTribe Research Panel, be registered with the LiveTribe Research Panel at www.livetribe.com ("the LiveTribe website"), and have provided their email address and fully completed the registration pages, including their personal information and demographic details as prompted. 3 Where a member is under the age of 18 years on the day of the draw, then the prize will be awarded to a parent or guardian on that minor’s behalf. 4 The employees of the Promoter, agencies of the Promoter associated with the Promotion, and their immediate family members are ineligible for entry into the Promotion. 5.1.1 Register as a new member of the LiveTribe Research Panel within the period that the Promotion is open and must be a resident of Australia and New Zealand. 5.1.2 Participate in a survey activity with the LiveTribe Research Panel within the period that the Promotion is open. Each survey will equal at least 1 (one) entry. 5.1.3 Fully complete the "Refer a Friend" form on the members area of the LiveTribe website to invite a friend or colleague to join the LiveTribe Research Panel. An email will be automatically forwarded to the referred friend inviting them to join and if they do so, the Eligible Entrant referring them will receive 1 (one) entry into the Promotion. The operation of the referring mechanic is subject to the Spam Act 2003 and in accordance with the Spam Act 2003 entrants must have the express consent of a referred friend before referring them. The number of entries given will be stated clearly on the Refer a Friend section of the LiveTribe website and members area. 5.1.5 Suggest a poll which is subsequently accepted and published on the LiveTribe website and members area. Each poll published will equal at least 1 (one) entry. 5.2 The Promoter reserves the right, at any time, to verify the validity of entries and entrants (including an entrant's identity, age and place of residence) and to disqualify any entrant who submits an entry that is not in accordance with these Terms and Conditions or who tampers with the entry process. Failure by the Promoter to enforce any of its rights at any stage does not constitute a waiver of those rights. 6.1 The Promotion commences on 17 March 2019 10am AEST and closes on 17 June 2019 at 10am AEDST. 6.2 The total value of the prize pool for the Promotion is a maximum of AUD $5,000. 6.3 The Promoter will draw 5 (five) winners, each of whom shall receive a prize of AUD $1,000. 6.4 The winners will be determined by random draw using a random number generator in Microsoft Excel. 6.6 Winners will be notified in writing by email or by telephone within 48 hours of the winners being drawn. 6.7 The names of the winners will be published on the LiveTribe website within 7 (seven) days of the draw. 6.8 The winners of the Promotion will receive promotional goods, services or cash to the maximum value of $1,000 each. Prizes will be delivered by mail or electronically within 6 (six) weeks of the draw. 7.1 In the event that any original Participant drawn has not come forward to claim his/her prize by 17/09/2019 (no less than 3 months) for Australian and New Zealand winners, from the Announcement date; the Promoter may conduct a further draw on 17/09/2019 at 10am AEDST at the same place as the original draw, to distribute any unclaimed prizes, subject however to any regulatory authority. The redrawn winner will be notified in writing and the results will be published on the LiveTribe website. 7.2 The winner or winners will be notified in writing by email or by telephone within 48 hours of the second draw. The results of the second draw will be published on the LiveTribe website within 7 (seven) days of the draw. 7.3 After the draw, the 5 Winners will receive promotional goods, services or cash to the maximum value of AUD $1,000 each. The total prize pool is AUD $5,000. 8.2 No permit required in New Zealand. 2 Entry to the Promotion is open to members of the LiveTribe Research Panel ("Eligible Entrants"). 2.1 Eligible Entrants must meet the required criteria for registration with the LiveTribe Research Panel, be registered with the LiveTribe Research Panel at www.livetribe.com ("the LiveTribe website"), and have provided their email address and fully completed the registration pages, including their personal information and demographic details as prompted. 2.2 The employees of the Promoter, agencies of the Promoter associated with the Promotion, and their immediate family members are ineligible for entry into the Promotion. 3.2.2 Fully complete all required fields on the entry form including first name, last name and email address. 3.3 Eligible Entrants are only permitted to submit 1 (one) entry to the Promotion each month. 3.4 The Promoter reserves the right, at any time, to verify the validity of entries and entrants (including an entrant's identity, age and place of residence) and to disqualify any entrant who submits an entry that is not in accordance with these Terms and Conditions or who tampers with the entry process. Failure by the Promoter to enforce any of its rights at any stage does not constitute a waiver of those rights. 4 The Monthly Member Competition Question will, to the best of the Promoter's knowledge, have only one acceptable correct answer, which will be determined before the Monthly Member Competition Question is published on the LiveTribe website. The acceptance or denial of entries based on their variance from the acceptable correct answer will be at the sole discretion of the Promoter. 5.1 The Promotion commences on 1 July 2018 at 12pm AEST and closes on 30 June 2019 at 3pm AEST. 5.2 The total value of the prize pool for the Promotion is a maximum of AUD $4,800. 5.4 The winners will be determined by random draw using a random number generator in Microsoft Excel. 5.6 Winners will be notified in writing via email within 48 hours of the winners being drawn. 5.7 The names of the winners will be published on the LiveTribe website within 7 (seven) days of the draw. 7.2 No permit required in New Zealand. 1 Information on how to enter and prizes form part of these Terms & Conditions. Participation in LiveTribe's Online Game Giveaway ("the Promotion") is deemed acceptance of these Terms & Conditions. 4.1 The Promotion commences on 07 September 2018 at 9am AEST and closes on 05 September 2019 at 11.30pm AEST. 4.2 The total value of the prize pool for the Promotion is a maximum of AUD $3,000. 4.3 The Promoter will draw 5 (five) winners each month that the Promotion is open, each of whom shall receive a prize of AUD $50. 4.6 Winners will be notified in writing via email within 48 hours of the winners being drawn. 5.2 The winner or winners will be notified in writing by email within 48 hours of the second draw. The results of the second draw will be published on the LiveTribe website within 7 (seven) days of that draw. 6.2No permit required in New Zealand. 1.1.1‘Cause’ means a submitted organisation, event, or community which is requesting funding from LiveTribe.com. These will not be subject to voting. 1.1.2‘Noble Cause’ means a validated organisation, event, or community which is requesting funding from LiveTribe.com. These will be subject to voting. 2.1 The opening of submissions is subject to the discretion of LiveTribe.com. The opening of submissions will be announced on social media (Facebook, Twitter, Google +, Instagram) and on our website. 2.2 LiveTribe members may submit multiple causes. 2.3 All causes will be submitted via the LiveTribe.com website. No submissions are available by email, mail, telephone or any other method. 2.5 The closing of submissions is subject to the discretion of LiveTribe.com. The closing of submissions will be announced on social media (Facebook, Twitter, Google +, Instagram) and on our website. 3.1 The opening of voting is subject to the discretion of LiveTribe.com. The opening of voting will be announced on social media (Facebook, Twitter, Google +, Instagram) and on our website. 3.2 The closing of voting will occur at the discretion of LiveTribe.com. The closing of voting will be announced on social media (Facebook, Twitter, Google +, Instagram) and on our website. 3.3 Only one vote is allowed per LiveTribe.com member. Members may never use more than one email address or sign-up for more than one membership. 3.4 This will be cast via the LiveTribe.com website. No voting is available by email, mail, telephone or any other method. 3.5 Your voting information will be held for the duration of the competition. Personal information will be held by LiveTribe.com as per Member T&Cs. 3.6 LiveTribe.com reserves the right to disqualify votes if it has reasonable grounds to suspect that fraudulent, excessive or suspicious patterns of voting have occurred, or if it considers there has been any attempt to unfairly influence the voting. This may include for example, votes from spambots, programmes designed to specifically vote continuously for one project, or from devices where it is evident that cookies have intentionally been disabled or other attempts have been made to try to vote in a way that is not in line with these terms & conditions. 3.7 LiveTribe.com reserves the right to disqualify Causes if it has reasonable grounds to suspect that fraudulent, excessive or suspicious patterns of voting have occurred originating from the organisation, or if it considers there has been any attempt to unfairly influence voting, or promote, or not discourage fraudulent voting. 4.1LiveTribe.com reserves the right to have the final say in choosing the Noble Cause which is to receive funding. A decision will be made based on combination of member votes and feasibility investigations. The decision of LiveTribe.com shall be final. 4.2 The outcome of the vote or poll will be revealed to the Noble Cause representative by LiveTribe.com via phone within a week of the vote or poll having finished. 4.4 The outcome of the vote or poll will be revealed to the public by LiveTribe.com on social media (Facebook, Twitter, Google +, Instagram) and on our website within a week of the vote or poll having finished.